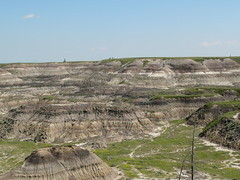 This was our first stop on our day out in and around Calgary – the Badlands. This canyon was a popular hang out for horse theives and the first nations people as its deep crevises provided shelter from the cold and a good place to hide. Coming upon the Badlands is interesting in itself as the surrounding land is flat for hundreds of kilometres on either side and then all of a sudden there is this massive canyon slicing the land in half. There is another photo which shows some tourists who hiked down into the canyon to give you an idea of its depth, or for a different perspective you can hire out Clint Eastwood’s Unforgiven as it was filmed here. There were heliopter rides over the canyon but for $40 pp for literally 5 mins you can appreciate that we enjoyed the view from the edge of the canyon rather than flying above.